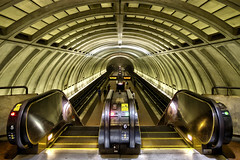 It’s hard to imagine the District without Metro, no matter how much we get frustrated by their escalator failures and constant reconstruction, the system is part of our DNA here, right up there with the Monuments, the Politicians and Lobbyists, and Embassy Row. It’s just there, ever has it been, ever will it be. What would happen if you woke up tomorrow and it just wasn’t there? WMATA then ran a second scenario in which the transit disappeared, but the region added new roads to get people to where they travel today. Just to keep congestion at present levels, the region would have to add more than a thousand lane miles of arterials and highways, at a cost of about $6 billion. This would be the rough equivalent of adding 15 more lanes to the already massive beltway that encircles the city – or, all of these roads, many of which run through the core of downtown, where street expansion would be all but impossible. Metro’s not so bad now, is it? DC would be little more than a bunch of freeways through ghettos to Federal Office buildings without Metro.